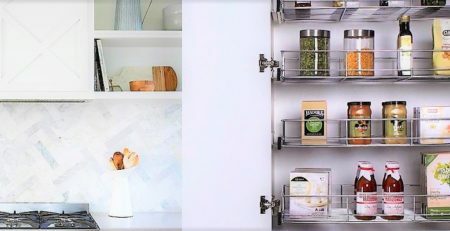 You’ll love our kitchen storage solutions under $100! Create better access in those hard to reach places. You’ll see everything and access everything without compromising quality. Say goodbye to digging in the back of cabinets. Most of the products shown are easy to install or you can take advantage of our installation service. 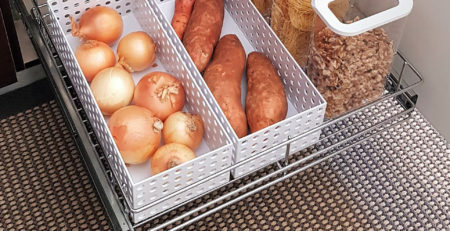 These slide out bottom mount baskets can be installed to any fixed (or secured) shelf. You don’t need a ‘perfect fit’ – you can install them anywhere on the shelf. They come in an extensive range of sizes and are super easy to install. Basket 300W x 100H x 485D including full extension slides. 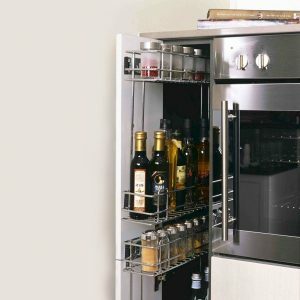 Door mount racks can be fixed to a cabinet door. 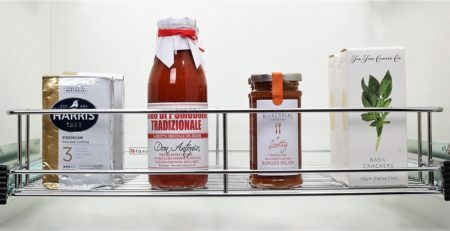 They maximise all available space in your pantry or cabinet and don’t interfere with already existing shelves or pull out baskets. 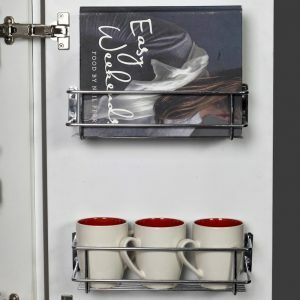 The wire is stainless steel so no need to worry about rusting spice racks – they are built to last. 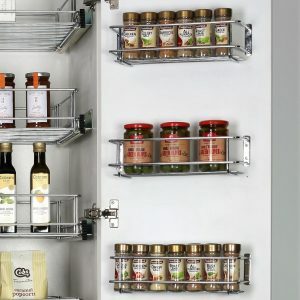 Our door mount racks are not just for storing spices! 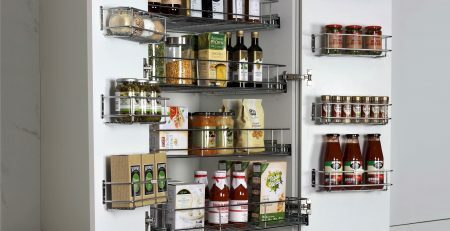 You can store cook books, chopping boards, coffee mugs… anything you can fit. They are inexpensive and only need minimal installation time. Other sizes are also available, so contact us for more information. Minimum space, maximum storage! 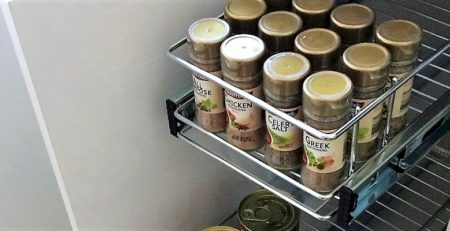 Create better access in narrow cabinets using slide out storage. 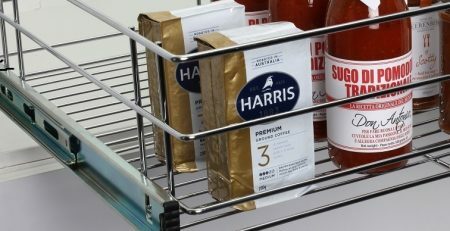 Baskets fully extend so products are easy to access. 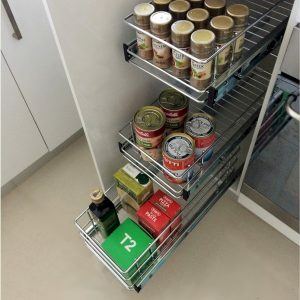 If your cabinet is too narrow for side mount baskets, you can use bottom mount slides to allow you to get in there with a drill. 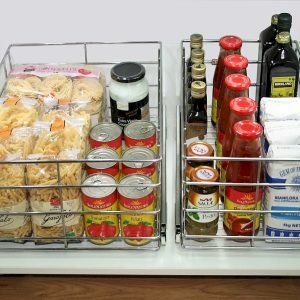 By removing adjustable shelves and adding slide out baskets, you can increase your storage and improve your access into narrow cabinets. 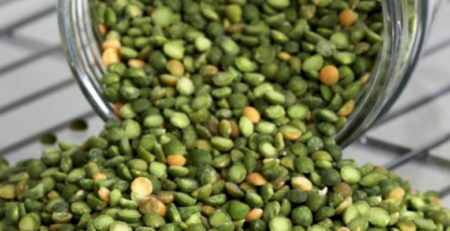 Non slip bases are a suitable additional extra that secures bottles, spices, jars etc from falling, rolling, moving or even breaking. Basket 200W x 100H x 485D, including full extension slides. 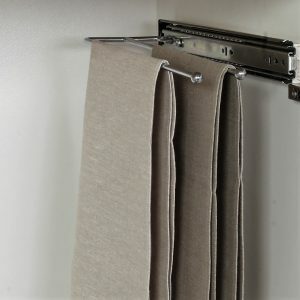 This pull out Tea Towel Slide is made using stainless steel wire, which is important for an area that is potentially damp. Store your towels efficiently and they can dry out of sight. It won’t rust and will last the test of time. 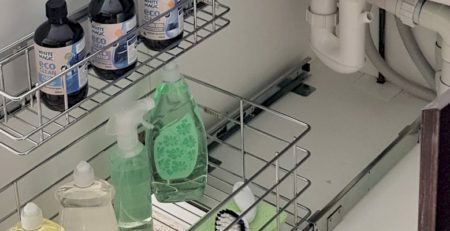 A simple addition to your under sink cabinet. Please contact us for more information or product advice. You can request our latest catalogue for prices and specifications. Products are suitable for Do-It-Yourself installation or we offer a professional installation service in most Australian areas.